The 14th Vega mission from French Guiana – which will orbit an Italian Space Agency Earth observation satellite – has been authorized for liftoff tomorrow following completion of its launch readiness review, which was conducted today at the Spaceport. The assembled Vega launcher for Arianespace Flight VV14 is shown at the Spaceport. 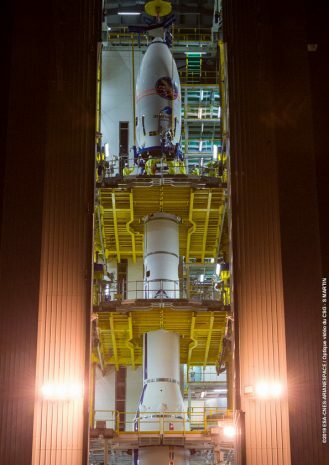 The light-lift vehicle is protected by a mobile gantry which will be rolled back prior to the liftoff on March 21. This assessment – held prior to each flight of an Arianespace launcher family member – confirmed that the vehicle and its PRISMA (PRecursore IperSpettrale della Missione Applicativa) payload are flight-ready, along with the Spaceport’s infrastructure and the network of downrange tracking stations. All is now set for a March 21 liftoff at precisely 10:50:35 p.m. local time in French Guiana (1:50:35 UTC on March 22) for a mission lasting 54 minutes and 8 seconds. Tomorrow’s mission is designated VV14 in Arianespace’s numbering system. It will be performed from the Spaceport’s SLV launch site – where the Vega was assembled and now stands in a flight-ready configuration, protected by a mobile gantry that will be withdrawn prior to liftoff. 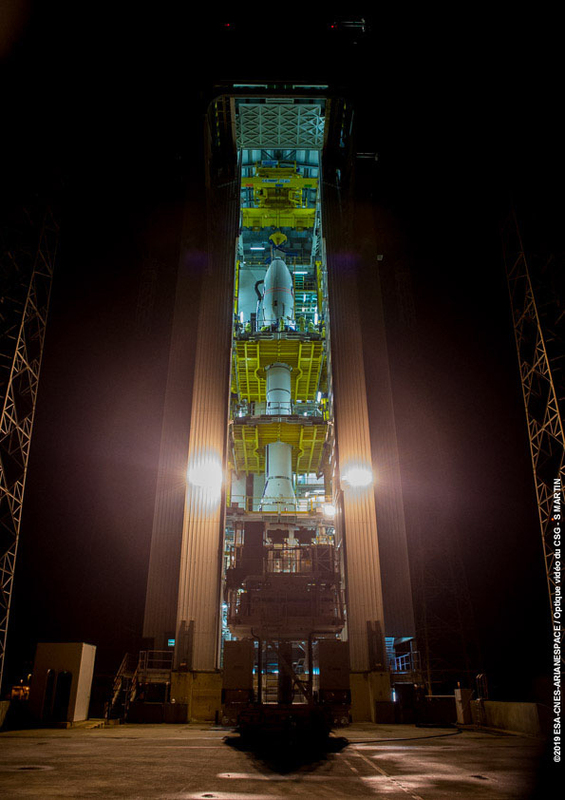 Flight VV14 will mark Arianespace’s third mission in 2019, and is the company’s first this year using a lightweight Vega launcher – which is one of three launch vehicles operated by Arianespace at the Spaceport, along with the medium-lift Soyuz and heavyweight Ariane 5. PRISMA – which will be operated by the Italian Space Agency (ASI) – was built by OHB Italia on a dedicated platform hosting the payload supplied by Leonardo Airborne and Space Systems. Once operational, it will support major applications to protect both the planet and Italy’s national security. It is fitted with a state-of-the-art electro-optical instrument and a hyperspectral sensor with a medium-resolution photo camera sensitive to all colors (panchromatic); and will employ these capabilities for environmental monitoring, resources management, identification and classification of crops, the fight against pollution, homeland security among other uses. PRISMA will be the third satellite launched at the service of ASI by Arianespace, whose backlog comprises two other spacecraft for the Italian space agency.